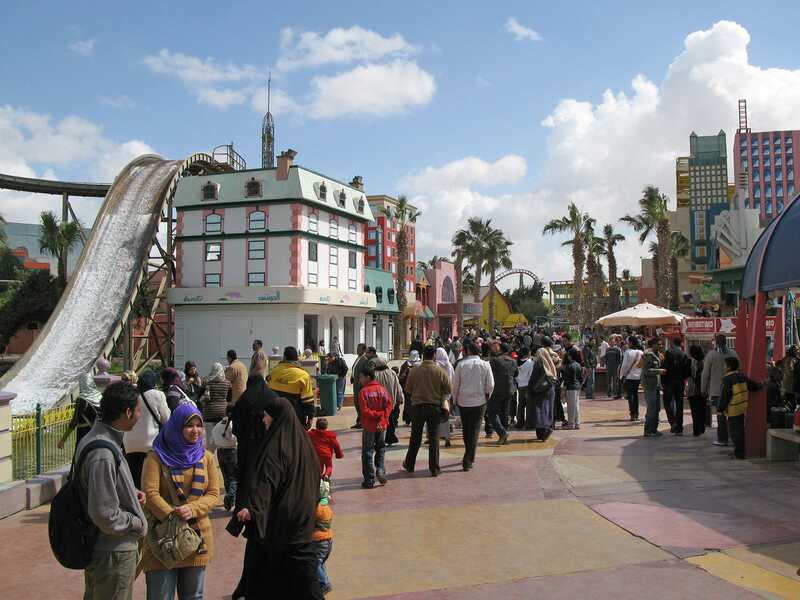 Dream Park is the largest amusement park in Egypt and one of the two that I'd describe as being of international standard. It features three roller coasters, all off the shelf models from the Vekoma catalogue. As such there isn't a huge amount that one can say about them that hasn't already been repeated in these pages ad nauseum; be that as it may it is worth documenting the relative comfort of the Roller Coaster (#1321), easily the best bonus helix suspended looping coaster I've been on. It could even be barely classed as rerideable, showing that the local engineers clearly know their stuff; we'd also have willingly repeated both the Family Coaster (#1322) and the Dark Ride (#1323). Beyond the coasters the park itself was spotlessly clean, colourful, and well themed. More than anything else it reminded me of Kuwait Entertainment City, and while that was certainly in part due to the Arabic signage (and clothing) it was also due to the general feel of the park. It proved a remarkably pleasant park to just relax in rather than just tear around the place; indeed it seemed like many of the locals were doing just that, as many of the rides had far more spectators than passengers. I've never been a particular fan of spin rides, but I'll occasionally do one given the right motivation. Dream Park is home to that monument to tedium, a Huss Condor, which has as its sole redeeming feature a large height which can on occasion provide excellent photo angles. For whatever reason the queue for this ride was one of the longest in the park, but after half an hour I was finally on board. Sadly, a misbehaving camera ruined the best opportunity for the shot I wanted, and I didn't have the energy to queue a second time. Magic Land is located a few miles down the road from Dream Park. First impressions were hardly welcoming, with the entrance gate leading onto what appeared to be a large and for the most part empty road. However, a brief walk brought us round a corner and into the ride area which was far more promising. Though far smaller than Dream Park there were still plenty of attractions, and closer inspection revealed an decent sized indoor area too. The number of people that can be fit in a Mack Wild Mouse car appears to depend on your country. In England, recent changes to the local rules mean a maximum of two, and those must wear truly unnecessary seat belts that have been retrofitted to a ride that was never designed to feature them. In the United States, that number expands to one per seat. In this park, however, we saw several instances of six simultaneous passengers on the Wild Mouse (#1324). Needless to say this extra weight ensured the cars took corners at top speed, making this one of the more intense wild mouse coasters I've been on. The only black mark was operational policies; though the ride featured ten cars, the staff were only allowing two on circuit at a time for reasons best known to themselves. It was a similar story on the otherwise excellent river rapids ride, a Hafema built model that was running no more than five boats today. Given that the pumping system costs the same to run no matter how many boats are on course this made no sense to me, as it wouldn't have an impact on costs. 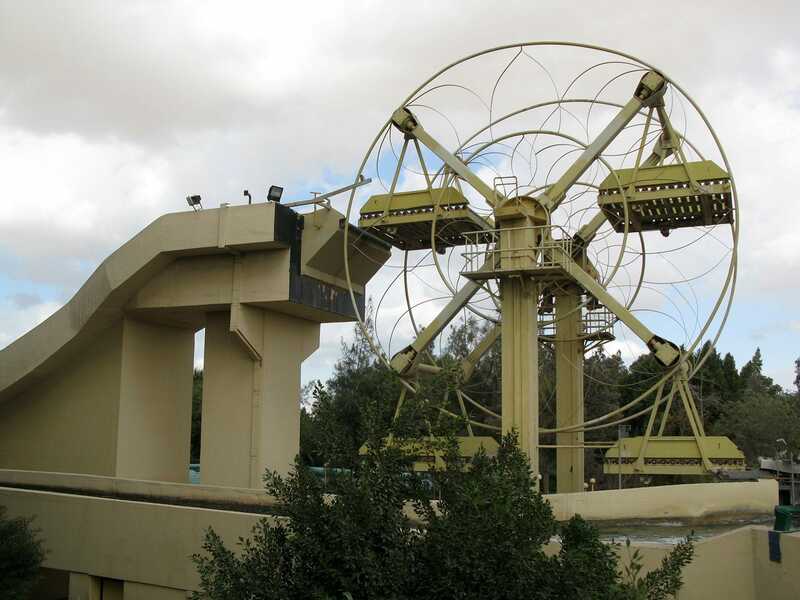 The highlight of the ride appeared to be a ferris wheel lift system and giant splash (pictured above) that was unfortunately not in use today; presumably it only operates in warmer weather as it looked to be utterly drenching. We'd been warned prior to this trip that Koki Park was, to put it gently, not entirely up to the standard of the two magnificent parks visited earlier in the day. Be that as it may, none of us were quite prepared for what we found; a location that can really only be described with a single word; ghetto. 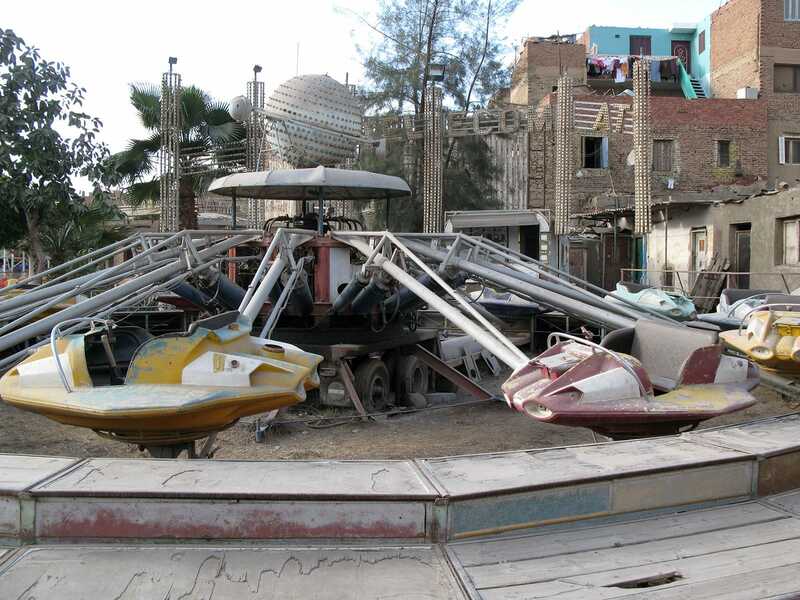 The park is only a few kilometers away from the most famous tourist attraction in the region, the Giza Pyramids, but one glance was enough to see that no sensible tourist would ever deign to visit; other than one apparently new flat ride the majority of the attractions ranged from run down to positively scary. The latter category included the sole coaster. It was just possible to observe the remnants of the pink paint the Wacky Worm (#1325) might once have worn; the local climate having almost completely eliminated it. The train was no better, it being scuffed and scratched beyond any operational ride I've seen. More worrying was the state of the lap bars, with one distorted badly out of shape and several others missing outright. This was not a ride that would get insurance coverage anywhere else in this world. Having said all that, it proved great fun to ride, not least due to the obvious parallels with the Final Destination movies. Additionally, the trim brake on the drop was out of order, resulting in easily the strongest laterals I've ever experienced on a ride of this type.